I'm wondering about meaningful alternatives to the unity candle ceremony. I've read up on some options out there, but really haven't found anything that I've fallen in love with. The sand ceremony is nice, but so many of my friends have used it that I feel like I'd be ripping them off. Exchanging roses with the mothers from each family seems a little too simplistic, my FH doesn't drink wine (or any alcoholic beverage, for that matter), and I have a black thumb, so I'm afraid I would kill a money tree plant (THAT can't be a good omen for the marriage!). Any advice for a truly offbeat and meaningful ritual that I can include in our wedding ceremony? Personally, I don't see anything wrong with doing a sand ceremony just because your friends have done it. There's always that risk with nontraditional weddings that, rather than blindly follow tradition (ie walking down the aisle to Pachelbel's Canon because that's what everyone's supposed to do), you blindly refuse to do something that's been done before. If a sand ceremony resonates for you, tell your friends how much they inspired you, and then DO IT. It's not like your friends invented the idea and it could be a great opportunity to share with them how meaningful you found their weddings. That said, if you really want to do something else, there are options. I'm a big fan of the unity cocktail, but since your partner doesn't drink that one's definitely not going to work. You'll find a nice round-up of unity options here, but it may be that a ring warming ceremony is the perfect solution. The concept is simple: near the beginning of your ceremony, have your officiant let your guests know that your rings will be making their way through the assembled guests, with an invitation for each guest to hold the ring, say a silent prayer/blessing for your marriage, and then pass it to the next guest. Then the officiant can pass out the rings, and continue on with the ceremony until it's time for you and your partner to present the rings to each other. Obviously, there are limitations to a ring warming: it wouldn't work well for super large weddings, and if you're having a big wedding you may want to have someone watching the progress of the rings and keeping them moving in a timely manner through your guests. Some people worry about rings getting dropped during the ceremony — if you like, you can affix them to a pillow or book or some other symbolic item for the passing. If you'd like some inspiration, check out ring warming ceremonies featured on Offbeat Bride. Oh and PS: if a ring warming doesn't appeal, you could always do a guest bouquet! My best friend incorporated both a ringwarming into her wedding, and I absolutely loved it. I think she actually got the idea from either me, or OBB the book! The officiant announced it would start with the Mother of the Bride and work its way back to the Mother of the Groom (there were approx. 75 at the wedding), and to avoid the rings being dropped or lost (!) they were in a small drawstring bag. They made the circuit in ample time before they were needed back at the front. If I wasn't planning on packing the people into my church for my own ceremony, I'd definitely make a ringwarming part of it! We had a ring warming, and it was such a beautiful moment. Most of our guests had never heard of such a thing, so our pastor gave a brief description of what it was, asked each of them to say a blessing over them, and then pass 'em along…we had SO many people come up to us afterwards, saying how meaningful and wonderful they thought it was! And just to note, a unity drink/cocktail doesn't have to alcholic. You can put anything you want in the cup from water, grape juice, or even a favorite soda. Ooh, you just gave me a great idea…a two-person straw! You wouldn't be able to drink from a Y-shaped straw alone; you both need to work together in order to drink. It's a great metaphor for marriage. I thought for sure someone would have thought of this already, but a google search turns up nothing. If nothing is striking you, maybe you don't need to add anything additional in. If after some research there is something that resonates with you two, then do it – even if you fear that it's copying somebody else. But don't feel that you need to add something just because other people have. Ultimately, it's about what works for you and is representative of you. The ultimate act of unity is that you're making a public promise to be together! My mom sewed us a Celtic knot ring pillow, and we tied the rings to that and passed it around during our ring-warming. It was pretty quick, since we only had 13 guests, but it made it that much more personal. I am so excited about this. My fiance and I *just* decided to include this in our September 12th wedding. All along we have been working to create an intimate wedding, and this is the perfect way to get our friends/families involved! 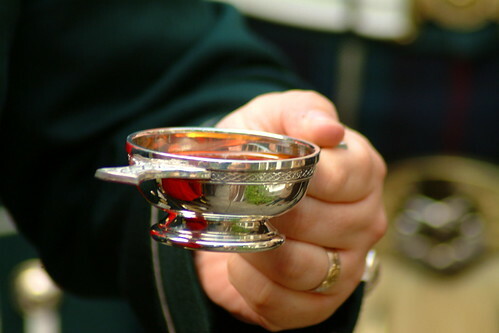 One great tradition which I used is the Celtic Quaich – a small silver bowl with two handles. Usually the family will fill it with whiskey or scotch, and the family and couple each take a drink, with the last person drinking the last of it. It's also used when friends are going away, and was used as a greeting between different tribes – the cup is passed with both hands on the handles, and is received with both hands, to show that neither is carrying weapons. If you're Scottish or Irish, it's a great ceremony to incorporate! We liked it so much that we did it 3 times at our reception; once for his family, once for mine, and once for our Regimental family. It was really touching. Obviously this wouldn't work in this case, with the one partner not drinking, but in general it's a nice alternative to a unity candle. what about with a soup broth? Or locally made cider? Mexican hot chocolate? Heck, you can customize it, fer sher! I love this. While I do find a Unity Candle very meaningful, I would love to use this ring warming idea as well! I know it's not something different from the unity candle deal, but it's a spin that might make it more appealing: you can give out tiny candles to guests as they come to the ceremony (they sell mini thin ones on religious sites for Easter vigils). From the back, the guests pass the flame until it comes up to the couple who them bring it together for their unity candle. "we will now pass the rings around, carried by (name) in this dish (pillow, bag), and we ask that each of you hold your hands over them and wish something good for the couple, who are to wear them on their fingers from now on. You may speak your wish aloud or simply make it silently. Your positive thoughts and energies will imbue these simple objects of metal with more than just the hopes and dreams of these two lovers. These wishes will show that they have a place in the community, and that it is blessing and supporting their union. Unfortunately, we will have too many people to do this, so instead we are giving people paper and pen at the beginning of the ceremony to write a wish or prayer to us and then will collect them all during the service. Or you could always include a handfasting ceremony into your wedding. To show that you are truly bound to each other. What a lovely idea, that got my eyes a little misty! We tied our rings on lengths of ribbon about 6 or so inches long so that people could hold them with ease while still attached to the bowl. We also did ours before the ceremony. We are doing a variation on this. The guests will have the chance to "warm the rings" as they enter into the ceremony area. We are having some friends at a table with a sign. With 200+ people there is just not enough time durning our ceremony, but we wanted it SOOOO bad that we had to make it work! If you wanted to personalize the sand ceremony, you could gather earth, sand, stones, etc. from either places that mean a lot to you or places you've visited together in small, separate jars. You and your beloved would then take turns pouring a little bit of earth/sand/stones from each place into one jar, a little bit at a time. If you aren't having attendants and want unique roles for friends and loved ones in the ceremony, each person could stand and read a line or two about where each small jar of earth came from (your grandmother's garden, your elementary school playground, the beach where you had your first kiss, etc). We are building a time capsule for our vows by placing objects that repesent qualities we want to bring to our life together into a box. In order to involve our loved ones, we are giving each of them a notecard & pencil to write a note to us and place it in the time capsule as they come through our receiving line. Our plan is to open the capsule on our 25th anniversary. I know this doesn't really apply to your situation because one of you doesn't drink, but we did the Wine Box Ceremony. We have a bottle of wine and 2 wine glasses, (we also included a key chain corkscrew because you never know!) and then during the ceremony we put in a love letter that we each wrote to each other (we didn't read them before we locked the box!). We also slipped in our papers we read our vows from during the wedding. Then if we ever have a serious crisis in our marriage we will open the box, drink the wine while we read the letters and our vows to remind us why we got married in the first place. We also can open it on our 10th wedding anniversary. I hope not to read that letter for 10 years! My husband and I are not super religious and wanted something like a unity candle to do for our wedding that was unique. It happened to be right before July 4th and we ended up buying a bunch of those snake things from a fireworks stand and constructing one huge snake. We lit it during the ceremony and it was awesome! This would be great for my wedding! Both of our families are very deeply rooted in our faith and i would LOVE to wear a ring knowing that my loved ones had prayed for the well being of us and our marriage. My husband and I did the ring passing for our ceremony because neither of us is religious and we did not have any wedding party to be a part of the event. So instead we made everyone a part of it by passing the rings through the crowd of about 40 people. We tied the ring together with a small ribbon to make sure we didn't lose them. It worked perfectly! Friends of ours had an usher pass around small stones to each guest to hold in their hands and infuse with their good wishes, and at the end of the ceremony the stones were collected in a jar for the couple to have as a reminder. We are planning something similar, but with a twist: at the entrance to the ceremony will be a table with clear glass votive holders containing candles, single flowers, feathers, etc. (originally it was going to be just candles, might still be) and an attendant will ask each guest to carry the item of their choice up to the "alter" (display shelf behind where the officiant and couple will stand) infusing it with their wishes for the couple, and making a beautiful backdrop for our ceremony. A good friend had a small wedding in a tiny old school house. She had requested no decorations, but the empty chalk boards were calling out for flowers, so the guests organically started drawing flowers for them (one was a venus fly trap with "crunch crunch" written near it) as we waited for the ceremony to come. It was beautiful and the bride loved it. i would probably affix the rings to a favorite book or record so that no one would drop them! An idea that my fiancee and I stumbled upon and have incorporated is the Yoruban Tasting Ceremony. the couple feed each other four different elements, signifying different facets of married life: sweet for the happy moments, sour for the disagreements and arguments, bitter for the times of hardship and loss, and spicy for times of passion. The ceremony symbolizes the couple's commitment to support and nurture each other through all of life's events. Some friends of mine just did a "unity volcano" at their recent wedding. Yep, the elementary school red dyed vinegar and baking soda type. My aunt's wedding had a ring-warming cermony, she had her ring bearer hold the pillow and as everyone was filing into the church, they blessed it. We had a ring warming ceremony and while it was new to our guests, everyone loved it. Especially me! I feel like our rings are extra special now. Our wedding was held outside in January in Canada… brrrr! So we asked our guests to literally warm the rings with their hands while symbolically warming them with their love and good wishes for our marriage as they passed them. I was slightly nervous about them being dropped as we were on a bridge over a river with little gaps in the boards… but didnt want to attach them to anything. We tied them together with a couple pieces of thin ribbon so they stayed together and were a little more substantial and colorful. And I let go of worrying about it! my daughter and her beloved did a unity braid,the sections of the braid represented her, him and God, they have it tied to their back door as a gentle reminder. I love the idea of the ring warming, what a fantastic way to involve those you love! we are doing a handwashing ceremony, i think its going to be very meaningful. Officiant: Bride and Groom, today, in front of your family and friends, you start your life together anew as a married couple. As with any new endeavor, it is best to start with a clean slate – putting problems big and small behind you. You come acknowledging that the person you have chosen is not perfect, yet fits with you in a way no other person can. Whatever difficulties you may have experienced, today you have decided that your love is bigger than any of them and you have chosen a life together. Water brings forgiveness and we all need forgiveness. We need to forgive others and we need to forgive ourselves. As you wash your hands in this bowl of water, forgive yourself and each other for any pain in the past. Allow yourself to be forgiven for your human imperfections. Allowing yourselves to have your hands dried by each other signifies your vulnerability. And we have to be vulnerable — it breaks through isolation and in our own vulnerability, we become more caring and understanding of our mate. In a loving and compassionate marriage, to achieve the greatest intimacy, you must have the courage to be open and vulnerable to each other. Bride and Groom, do you begin your lives together with grace and compassion?